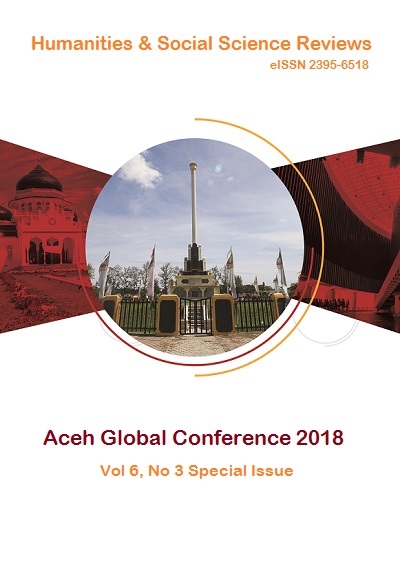 ACEHNESE COFFEE SHOPS AS PUBLIC SPACES: ACEH POLITICAL PARTICIPATION MODEL IN YOGYAKARTA | Humanities & Social Sciences Reviews Articles invited for Vol 7, No 2 issue. Upload before 30th May 2019 in Make a Submission tab. Faculty of Economics and Business, University of Indonesia, Indonesia. Purpose: This paper aims to recognize a new form of political participation that is expressed by Acehnese coffee shop drinkers in supporting and criticizing local Acehnese politics, particularly those in Yogyakarta. Furthermore, this research examines the role of informal movements and clubs involved in decision-making related issues of Acehnese living in Yogyakarta. Methodology:This is a critical qualitative approach with in-depth interviews and participatory observation over several months. Participatory observation was conducted through immersive participation in Acehnese coffee shops as public spaces and in-depth interviews with coffee shop managers, community leaders, and regular customers. Findings: The Acehnese unique cultural and social culture of coffee drinking plays a dynamic role with Acehnese community’s relationship with politics. This culture facilitates the existence of Acehnese identity in Yogyakarta and intensifies political participation through informal discussion. Acehnese coffee shops are free and autonomous public spaces, which are collectively owned and persevered by the community. Implication: Informal politics and local identity expressed through far political distances are interesting in Indonesia to examine social cohesion and capital nationwide. Out study also develops a model contributes to political science in Indonesian by explaining the relationship between informal and formal politics. It helps explain differences of different cultural and ethnic groups in Indonesia. Originality: Our paper investigates the perspective of local politics within Indonesian politics. Furthermore, most contemporary political research focuses on formal and official politics, while this paper uncovers long distance informal politics embedded in unique Acehnese social culture in coffee shops. The civic contribution of Acehnese coffee shops as a public place in Indonesian democracy is convincingly established in this paper. 1. Ambardi, K. (2009). Revealing Politics of the Cartel. Jakarta: Popular Literature Gramedia (KPG). 2. Al Fairusy, M. (2013). Public Sphere in a Cup of Coffee: Seeing public spaces and producing discourse in Aceh coffee shops. Journal of Sociology USK. 4(2),18-30. 3. Carmona, M, Health, T., Oc, T., and Tiesdell, S. (2010). Public Place Urban Space: The Dimensionof Urban Design. Oxford: Architectural Press. 4. Damsar. (2010). Introduction to Political Sociology, Jakarta: Kencana Media. 5. Ghaffar, A. (1997). Accommodate People's Participation. Journal of Social and Politics, 1(1),8-26. 6. Habermas, J. (1989). Public Space A Study of Community Categories Bourgeois. Yogyakarta: KreasiWacana. 7. Huntington, S.P. and Nelson, J. (1994). Political Participation in Developing Countries, Jakarta: RinekaCipta. 8. Madanipour, A. (2003). Public and Private Spaces of the City. London: Routledge. 9. Mauriza, S. (1998). Coffee Shop in Aceh Community Life. Yogyakarta: UGM. 10. Nasrullah, R. (2012). Internet dan Virtual Public Space, A Refelstion of Habermas’s Theory. Journal of Communicator. 4(1), 33-46. 11. Rahim, E. I. (2013). Participation in The Public Policy Perspective.UNG Repository. 12. Rauf, M. (2000). Political Consensus: A Theoretical Assessment. Jakarta: Directorate of General Higher Education, Ministry of Education. 13. Roza, P. (2013). Public Space: Track "Democratic Participation" from the Policy to Cyberspace.Journal of Sociotechnology Institute of Technology Bandung, 12(30), 559-562. 14. Surbakti, R. (1992). Understanding Political Science, Jakarta: PT. Grasindo.